Always drive with safety glasses! I started wearing glasses full-time in 2000. And readily I learned benefits of eyeglasses beyond the prospect of improved vision. You never know when you’ll wish you had worn protective glasses. Experience is a poor (or rather, very expensive) teacher on this point. You only receive two chances, one eye and then the other. The safest course is to always wear glasses. Some instances, like hunting or target-shooting, or use of impact tools, are more obvious than others. Low-hanging branches quickly showed me the protection of eyeglasses — Whack! The lens receives the snap of the limb and my eye only blinks. Cool, these things are keepers. Though, aside from bike-riding, I hadn’t thought of eye risks while driving. It’s rough country out here. 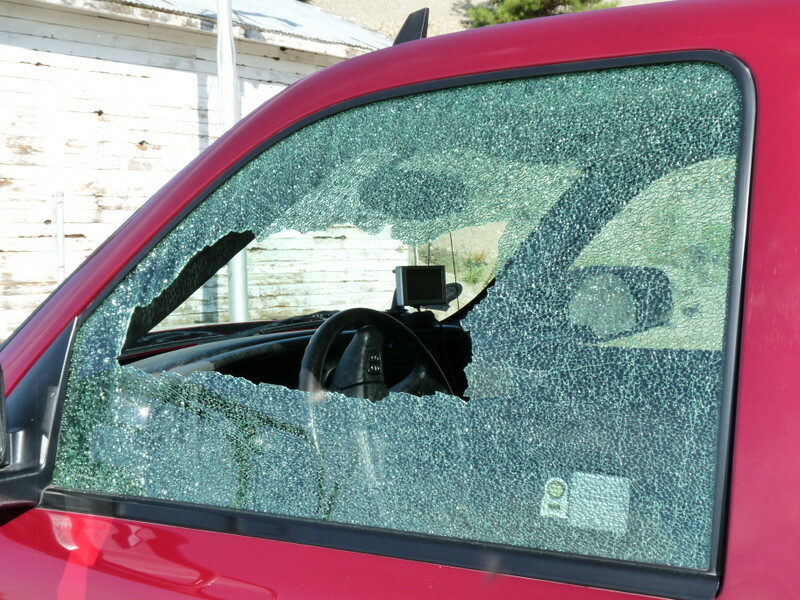 An hour into our drive along Highway 3 from Rock Creek toward Hope, B.C., a rifle-shot noise surprised us and the driver-side window shattered. A very large truck passed in the opposite direction. 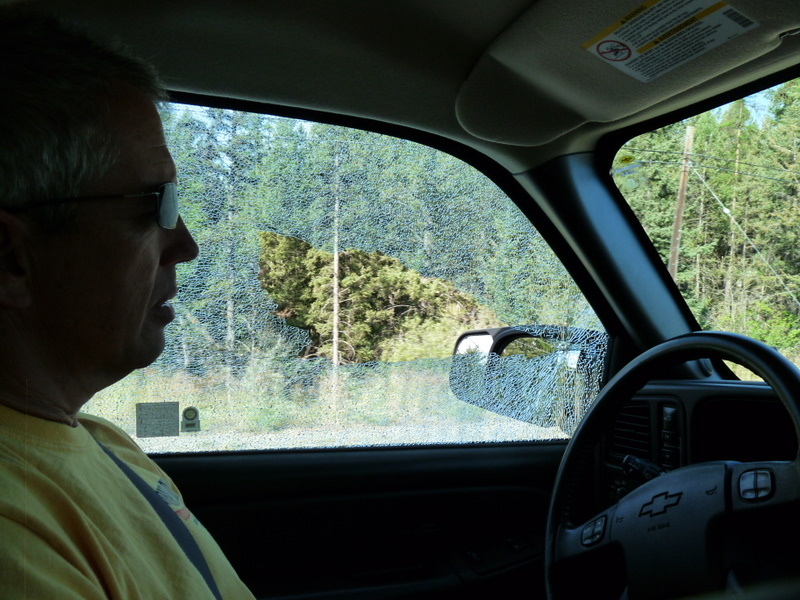 Debbie says she saw the fist-sized rock launch from the truck’s side toward our side-view mirror. The rock missed our mirror. How fortunate our window was closed! The rock smacked the window and instantly broke in a section. We soon find a pull-out, stop, and inventory our damage. Let’s see, the window’s snap-crackle-popping and pieces are yet flipping into the cab and down into the interior of the door. Tiny shards of glass are on the dash, the driver’s lap and seat, the floor mat, the armrest. We open the doors, mine gingerly, and climb out. The rock (or escaping pieces of glass) have chipped the door paint in several places but the truck exterior is otherwise fine. I don a pair of leather gloves and carefully push the broken safety glass out onto the gravel. Deb calls the insurance company to confirm, yes, this is far below our deductible and the glass cost might be approx $200. Then she calls a Chevy dealer just below the border to learn the lead time for this glass is 3-5 days. We need to continue west, toward Vancouver, and will before long arrive in Osoyoos. We drive on with a window open. Hey, this can’t be too bad. Everyone drove windows open until 40 years ago, right? Osoyoos has an auto glass shop but Darrell is out to a job. His son calls and tells us, yes, this requires a lead time. No news there. We have covered less than 60 miles in over two hours so far today. Miles to go before we stop. But while we have signal, Deb phones ahead to Hope, B.C., where our Garmin has detected a Chevy dealership, Gardner’s. We get good news almost immediately. Gardner’s will order the glass, have it by 9 a.m. local time tomorrow, shall they look for us? Deal! We easily find a really nice and small Provincial Park near Hope, and arrive promptly at 9 a.m. at Gardners. They’re ready for us and we’re out with a one-hour labor charge and a new (and matching) window. This could have been much, much worse. No one is hurt, our truck isn’t damaged, we missed no deadlines, our trailer escaped damage. We were heading toward a town, Hope, with a fine Chevy service department. The town is nice, really nice, with tennis courts, a center-city park, nice dining choices, a large grocery store, and several nearby Provincial Parks (with camping). And, thanks to my glasses, nothing got in my eyes. We’re enjoying this late evening sunset in Waterton Park, Alberta. Air temperature is 16, skies are cloudy and we have a 50-50 chance of showers tonight. Last night late the thunderstorm in Essex, MT, delivered frozen rain but, thankfully, no hail. Our low temperature last night was cooler than forecast, down to just above freezing. This morning we were up early and pulled our RV from the campground without dumping or refilling any tanks. Although we stayed Friday through Tuesday in the meadow and had no connections, we used the comfort station for showers and toilets. So our tanks are still at least half, or good for several more days. We also lacked electrical connections at Glacier Meadow Campground. The campground offered us upgrade to an electrical site when the hamfest ended, but we were coming along just fine without. We also, you may recall from an earlier blog, are doing without our solar panels. Or, at least, without any electricity from them. The solar panels are still up there and our solar charge controller is somewhere between St. Louis, MO, and Kalispell, MT. More on the charge controller later — the story is developing. There’s now a bucket under the solar panel wire to catch all the electricity from puddling under the trailer, but we still cannot get it into the batteries without the controller. How’d we make out without electricity from campsite or from solar panels for four days? Oh, and we also did NOT use our generator or anyone elses. We didn’t suffer. We used lighting for reading and tasks. We used the water pump and roof ventilation fans when we wanted. And the several other non-elective uses of battery power, like the refrigerator control system and interior light and the gas detector were “in use”. We minimized our use of electrical power and were able to keep the batteries above 11.5 volts throughout our stay. The water pump runs far less if you use the comfort station’s showers. The exhaust fan runs very little if you aren’t using the shower. We think the batteries were happy to reconnect with the truck’s alternator for the two-hour drive today, they were pretty juiced up when we arrived in Waterton. The drive Tuesday morning from East Glacier, MT, was short but spectacular, along Highways 49 and 89. The road was narrow and curvy but posed no challenges for our short truck-trailer combination. Nothing was else remarkable until our border crossing from USA into Canada. We ALWAYS rehearse for these border crossings, especially into Canada. Where are you from, where are you headed, how long do you plan to stay in Canada, what’s the purpose of your visit, are you bringing any gifts you will leave, do you have more than $10,000 with you, do you have any guns or other weapons, do you have any alcohol? We practice our answers. Stuttering or hesitating is NOT a convincing response to a query. Jim was a little tense on the way into this crossing, mostly because our last one (see this blog from Aug 5, 2009) was tougher than others. Here we go, we’re in the line-up at the border crossing, and the Canadian Border Guard opens the rear of the Mercedes ML350 in front of us. He’s opened the rear hatch and is going through a piece of their baggage. We stay back aways, giving plenty of room. Don’t want to seem too anxious, you know? The Mercedes driver is cautiously watching by way of his rear view mirror, seemingly wondering which bag the Customs guy is into now. The Customs guy closes the bag, lowers and latches the Mercedes rear hatch. Everything apparently checked out, he’s finished with them. It’s our turn, he signals us forward to his position 20 meters before the enclosed guard station. And then he tells us to advance to the guard station window, his colleague will check our credentials. We advance, slowly, to the window. Our trailer is rather wider than the truck so we pull a little away from the guard station before we angle the truck toward the window. She hands us our passports back and we’re in. Never mind the detailed list of how much (or how little) alcohol we have on board. Never mind the potential issues of meat, fresh vegetables, fresh fruit, eggs. 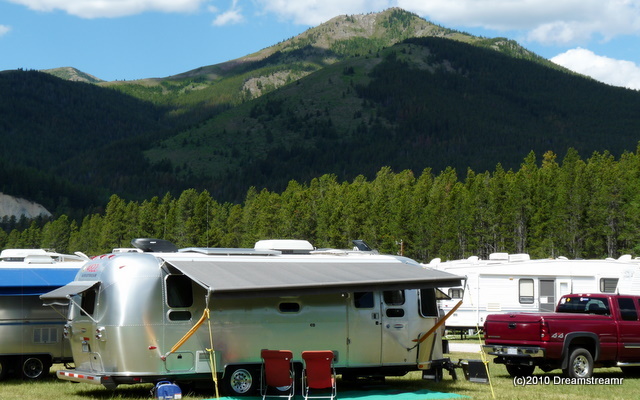 Never mind taking a look into the bed of the truck, or into the Airstream trailer. And the difference between last year’s entry and this year’s? Debbie was driving last year, the port of entry was Pembina, ND, and the Border Guard was an officious male. Which of those three differences was most important? We don’t know, but this was a much nicer welcome for a pair of highly law-abiding visitors. We don’t generally make reservations for parks we visit. The notable exception is for long weekends like Canada Day or Labour Day. And we have had no issues finding available sites heretofore. Until this week at Waterton Lake National Park. Every site is full and we are able to secure only a one-night site. This is a surprise, and could cut our visit short. Will we be able to get our boat cruise, hike, and high tea still? The helpful staff offer us reasonable hope for another night if we check tomorrow morning at 0800 for cancellations. Jim joins the queue the next morning, and at his turn at the window learns it will instead be 1100 to determine status for the next night. The helpful young lady offers to watch for us and flag a space for us if it comes available. Jim rechecks at 1100 and we get two nights in another elec site, closer to the Lake and with an unobstructed view. We moved and set up in our new site and had time to sit outside enjoying the warm sunlight before tea time. We dressed up in our Sunday clothes for High Tea at the Prince of Wales Hotel. We were fortunate to have a table near the grand windows overlooking the Lake. Our service was very pleasant with six cups of tea and a “tier”, the latter filled with short breads, tarts, fruit, and sandwiches. Great view up the length of Waterton, Waterton Lake, and the mountains around. The next day we paid for a 45 minute cruise aboard the M/V International, an 83 year-old cruise vessel, from Waterton to Goat Haunt, Montana. We were going to hike five or six miles to view Kootenai Lakes, a highly recommended day hike. We passed through U.S. Customs at the Goat Haunt Ranger Station and enjoyed a brief and pleasant conversation with the Border Patrol officers. Little more than a mile into the hike we were desperately trying to beat the mosquitoes away. We applied a liberal coating of bug repellent and still the bugs were landing and nibbling wherever they wanted. Enough of this! We returned to the Ranger Station and large covered picnic area to reconsider our options. Rain started in so we unpacked our lunch and conversed with one of the Border Patrol officers. She was on her lunch break too and expressed a lot of interest in our full-timing experiences. Several people had recommended the hiking trail from Goat Haunt back to Waterton Lake Townsite. We started on this trail as soon as the rain stopped. Unfortunately, the mosquitoes still were interested in us. We donned our goretex pants and our lightweight windbreakers to cover as much skin as we could. We had, at the start of this homeward trek, already completed almost three miles hiking. And the trail back to our campsite was nine more miles. A challenge for a couple of occasional hikers, for sure. But we’d heard it was mostly flat and along the lake. How difficult can this be? The nine miles encompassed five fifty to one hundred-foot climbs, so the hike might be classified as moderate difficulty instead of easy. We tried to pretend each uphill was to be the last one. Or this hill would end just around the very next bend (and it usually did NOT). Four hours later and in a steady rain, we stumbled into our campground wet and tired. All the wet gear, shoes and clothes landed in our shower, we stretched our achy muscles, and enjoyed a pot of tea before showers. We need the exercise but will benefit from doing it more often, not more strenuously. A regular exercise program is one of the little challenges of full-time traveling. We’re getting it figured out and need to apply ourselves better. This visit to Waterton has been everything we hoped and expected. Reservations for the campsite would have been helpful but we were fortunate to land a spot all three nights we wanted. The weather was almost ideal for the activities we planned. Tea at Prince of Wales Hotel was the high point of this visit, but everything was enjoyable. 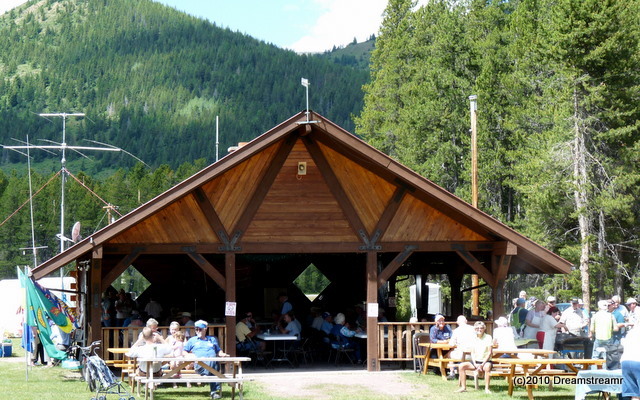 We witnessed, a few minutes ago, the closing of the 76th annual Glacier-Waterton International Peace Park Hamfest. 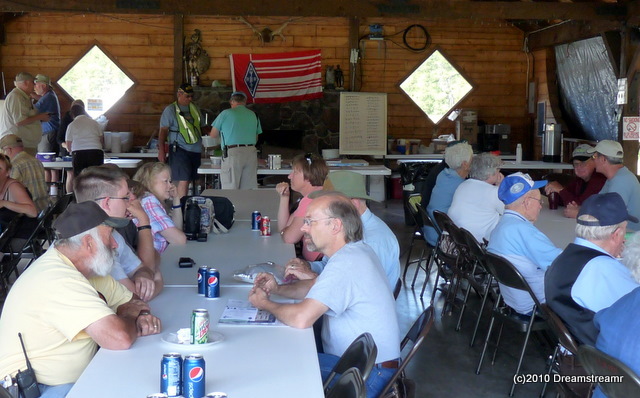 This hamfest was most like a very laid-back rally, not so much like any hamfest we’ve attended. The tempo and mood was mellow, not focused upon finding the best source and price on gear, throughout the weekend. This weekend’s greatest opportunity was meeting and talking with other folks. Absent also was the stimulating, yet somewhat tiresome, browsing past dozens or hundreds of tailgaters’ tables of electronics. Instead we saw perhaps one dozen tailgaters with the normal sorts of electronics gear and old books. Since the hamfest did not designate a special section just for vendors and tailgaters, the few tailgaters were mixed in amidst all the RVs. And it felt just right. Browsing constituted, as much as anything, walking about and socializing. Ask a ham about his antenna or his radio, or her truck or RV. And sit down and get to know each other a while. The hamfest was large enough to fill the pavilion, and beyond, at mealtimes yet the seminars and tailgaters operated at a relaxed pace. 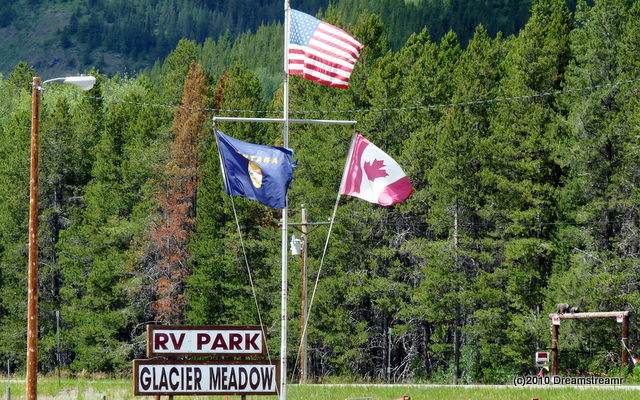 Glacier Meadows RV Park rented sites this week to hamfest attendees only, and we nearly filled the park. All sites with water or electric rented early through reservations. Most of us parked in the meadow with plenty of space and sunshine. Our weather was ideal with cool evenings, warm and dry days, and steady afternoon breezes. We lucked out and were able to face our RV to the north. Our large curb-side awning shaded the camper throughout the mornings and provided us a shady patio all afternoon. We were less lucky, sunshine-wise, for having lost, just one week ago, our solar charge controller. So much sunshine and nowhere to put it. All this sunshine is raining upon our two 125-watt solar panels and coursing through the copper wires down to our connectors. Alas, the stuff is still pouring out on the ground for lack of a charge controller to translate the potential power into something our batteries can store. We’re hopeful, though, we’ll pick up our refurbished charge controller at the post office tomorrow. We called the manufacturer two days ago and he advised he had already repaired it and shipped it to us. Our forwarded mail and the charge controller both, hopefully, await our pickup tomorrow. We’ll see. The temporary loss of our solar charging has not been any problem, though, for our batteries or us. Our batteries have maintained greater than 12.2 volts since we arrived two days ago, Friday early afternoon. We’re intermittently using our water pump, reading lights, mobile hf/vhf/uhf radio. Our refrigerator and natural gas detector and other phantom loads have run more or less continuously. This is our first-ever run-down test for these two 6-volt golf cart batteries. We very rarely disconnect the feed line from our solar panels to the charge controller. We almost always, when dry-camping for more than two days, set up and connect our generator to the RV’s 110v electrical input to allow occasional re-charging of the batteries. And, our generator is sitting alongside the camper. We have not connected the power cord to the RV, instead periodically noting the batteries nominal voltage. It helps we have had such nice warm days which excite the batteries a bit, and very late daylight each day. And we haven’t done after-dark cooking to require lighting. We are using the batteries very lightly, so this isn’t too much a test. Nonetheless, we’re enjoying the quiet boycott of our generator. The potluck yesterday evening, and the hamburger lunch earlier yesterday, were NOT characterized by a bunch of RVers showing up an hour early to eat. We arrived for the potluck at the scheduled hour and were surprised we were among the first ones to bring our food to the table. 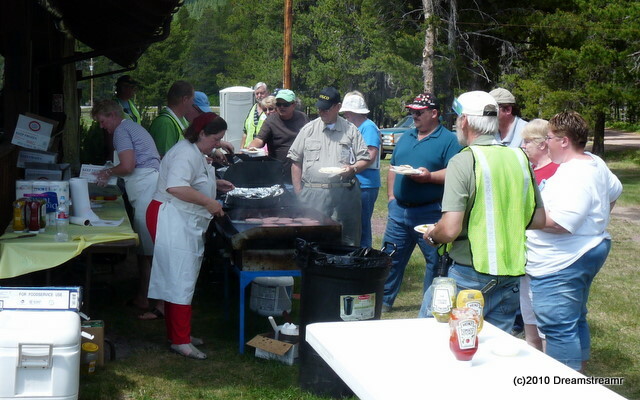 The hamburger lunch did kick off a little early to accommodate the large number of attendees already gathered nearby for other activities. There were not many activities in conflicting times, so it was easy to attend the seminars and still enjoy enough time on our own or for socializing and learning. A ham also, Debbie chose not to register and participate in the seminars or meetings. This is the most expensive hamfest we’ve attended, at $28.00. Only Hamvention (Dayton) was close, at $25.00 for walk-in tickets. And the price is worthwhile to us. 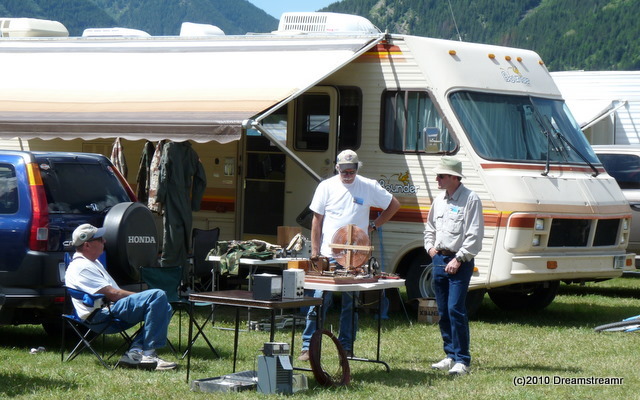 We like helping support a long-running hamfest for this very isolated part of the United States and Canada. We tire of hearing of activities, events, and membership organizations cancelled or terminated from apathy. When the hamfests disappear we all lose the option to stop and shop, browse and barter, talk and trade. The nearest large amateur radio vendor might be 600 miles distant, in Portland, OR (HRO). No equipment vendors showed this year, saving some of our money (for now). Last year they showed and next year vendors will show up, and they support the hamfest every year through donated prizes and discounts to attendees. One supporter, QRZ.com, drove approximately 1,400 miles to attend this hamfest. We enjoyed meeting and visiting with Fred AA7BQ and Robin. They are a lot of fun to talk with and have interesting stories. They showed us their new old motor home, a gorgeous behemoth (at least by our standards), in which they are representing QRZ.com at hamfests across the nation this summer and fall. If you’re in the neighborhood and can make it to the Shelby Hamfest (in Dallas, NC) on Labor Day weekend, take a minute to say hi to these friendly folks from Phoenix. A ham who has attended this hamfest since 1937 won the pre-registration Grand Prize, a new Yaesu FT-2900r mobile. It seems fitting, for someone who has supported this hamfest for so many years, to win the dandy mil-spec Yaesu amateur radio. The most special prize, the 1937 unopened beer bottle, was awarded through a hotly contested special auction. Two bidders were deadlocked for the honor of 2010-2011 custodian of this special bottle, and the honor was decided through paper-rock-scissors. We survived this enjoyable hamfest and people are pulling out in droves and calling out, “this is VE7xxx, mobile” as they hit Highway 2. Other hams chime back, “Safe travels, VE7xxx, from W7xx” and the same from several other hams from above and below the 49th parallel. We’ll hope to visit this hamfest when we’re again in this part of the country at the right time. And now we are sitting on the veranda at the Glacier Park Lodge. 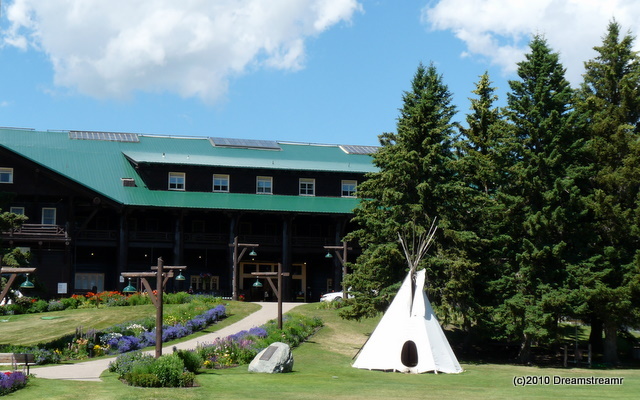 This 161-room lodge, built in 1912, is a grand place to visit. We visited two years ago and are just as excited to see it this time. The main lodge is magnificent, with tremendous tree-trunk posts and beams. The views from the veranda are great, looking northwest at Dancing Lady Mountain. The mountains still have snow on them, just in a few north-side spots. What a great part of our great country! We hope this is, for us, one of many encounters with the Oldest Hamfest in the World. 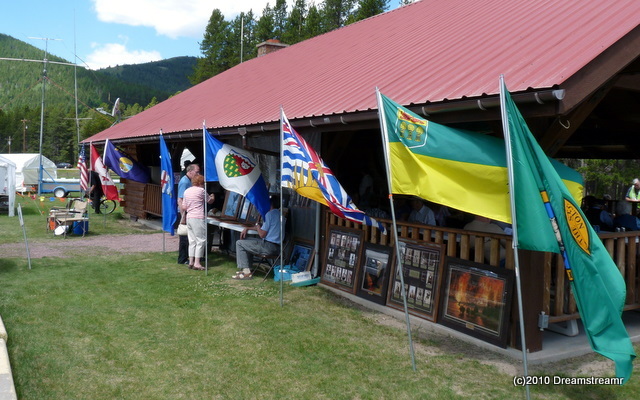 As much as we like checking out new radio and antenna gear and parts, we both enjoyed more this most sociable and friendly Waterton-Glacier International Peace Park hamfest. 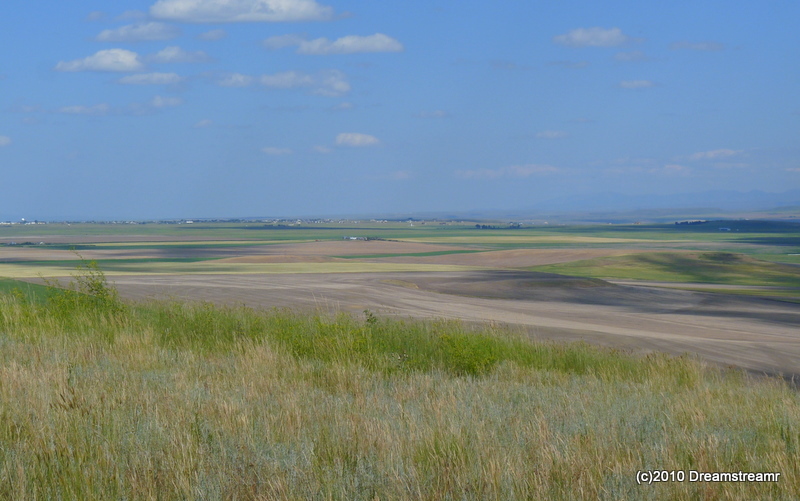 We arrived yesterday in Great Falls, MT, a few hours north of Bozeman. We immediately noticed a number of differences between the two cities. Great Falls is only twice Bozeman’s population, but is spread across a much larger geographical area. Great Falls lacks a large anchor employer of Montana State University’s size, although Great Falls has Malmstrom Air Force Base. And, unfortunately, the ore smelter shut down entirely and the Air Force Base reduced employment recently. We gave downtown a good walking over and browsed their kitchen store, a tea shop, and the candy shop. Not much help to the local economy, but we bought a bamboo whisk for matcha tea and several candies. We couldn’t buy a cup of coffee after 3:30 p.m. local time although the tea shop would gladly have brewed us a cup of any of dozens of kinds of tea. Great Falls has a very pretty county courthouse building and library. The downtown district has suffered mightily from several large shopping centers in the Great Falls suburbs. Downtown has enjoyed some financial investments toward revitalization but many businesses are shuttered. On a brighter note, nowhere have we ever found a more helpful and friendly US Post Office employee than in Great Falls. She offered to help the client in front of us repack her box to save on excessive shipping costs, and while the young woman was emptying her box for re-packing the clerk waved us in and helped us with our stamp purchase and priority box mailing. What a refreshing improvement! We’re looking forward to our next USPS engagement next Monday in Kalispell, MT, to pick up mail and a package. This morning we waited for the wind to abate and the outside temperature to climb above 65 before we ventured out. 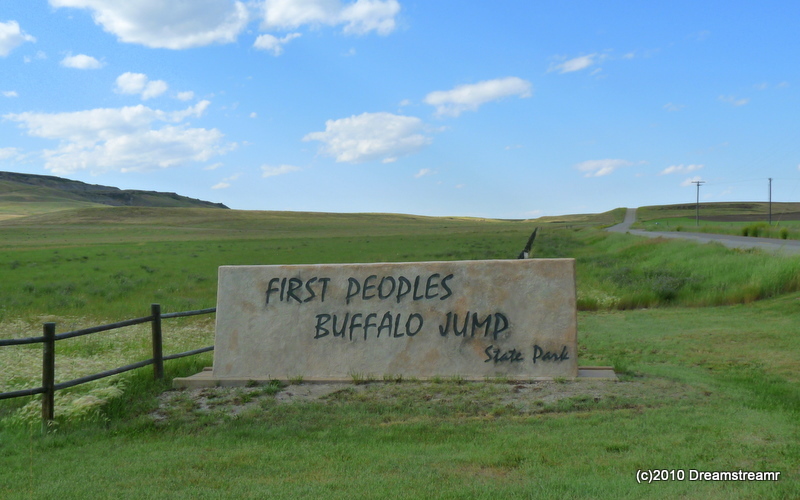 Finally, after lunchtime, we drove a very short ten miles to Ulm, MT, and found the First Peoples Buffalo Jump SP. This State Park is the first of many Montana pishkuns to have an interpretive center, and this is a nice one. We enjoyed learning about some of the 300 uses the Blackfeet and other Indians had for the buffalo. And this pishkun is the largest in North America and possibly in the world. 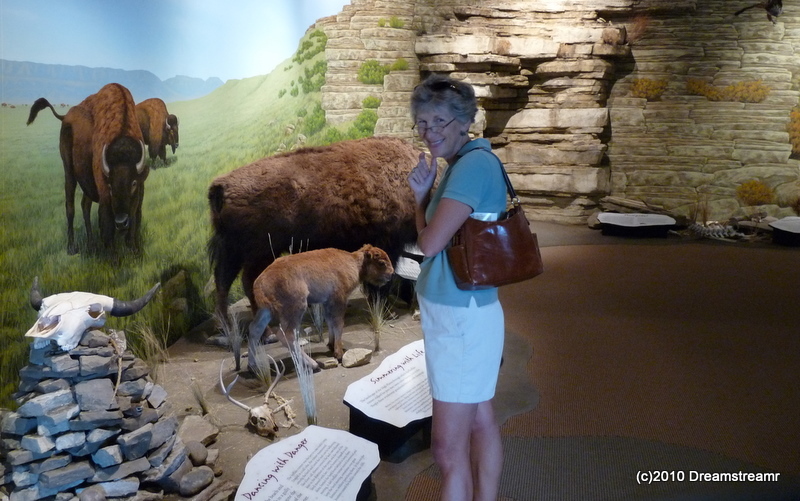 We spent an enjoyable three hours visiting the interpretive center, talking to the rangers, and hiking the three mile trail through the prairie grasses. 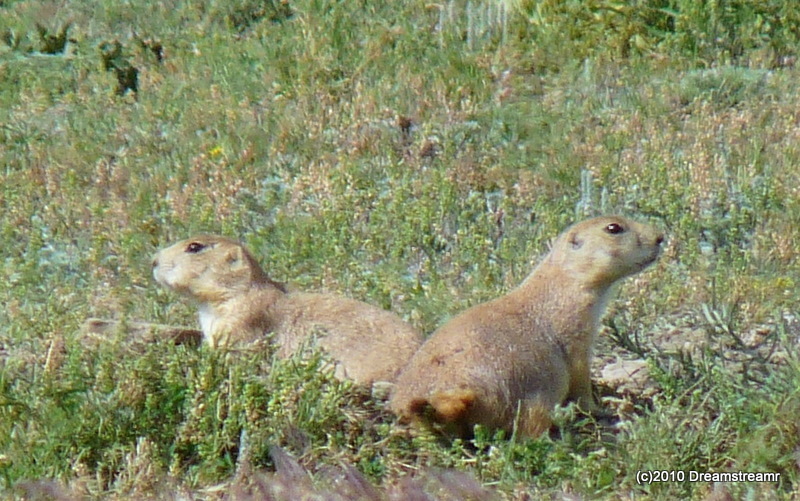 We wound our way to the top and found the extensive prairie dog town, full of its busy citizens. This is a spectacular place for the vistas. We looked out in all directions and saw beautiful ranges with grasses waving gently. Today we were blessed with a soft and steady breeze keeping us cool and free from biting insects. We paid five dollars admission for one out-of-state car, and one dollar for the hiking trail guide. The guide is a treat to use. Sixteen trail markers give you a chance to catch your breath as you climb up or down the three-mile trail and read the corresponding pages from the trail guide. The trail guide is very well written and gives readers a sense of what was happening one thousand years ago in this same place. We gained some perspective on the buffalo’s importance to the Blackfeet Indians, and how the Indians made careful and considerate use of the gifts from the buffalo. And we sensed how well centered the Indians could be in their lives and their hunting. Don’t miss this State Park, you’ll be glad you stopped. A turn for the worse in Bozeman, MT? – A man working at a store accidentally sprayed himself with bear spray. – A driver rear-ended another car on 19th Avenue after the driver’s grandson said “hot” and the driver turned to see what he was looking at. – A hotel clerk reported that a transient male had been coming into the hotel lobby and taking coffee and cookies. Kinda makes us wonder if every day can be this bad for Bozeman. Could this eventful Friday report be typical of a city of 27,000 people, especially in the middle of this college town’s summer break? We remember our previous Bozeman visit, two years ago, reading similar number and type of incidents in the police reports. We revisited Bozeman United Methodist Church this morning for Sunday worship. The service was nice and Pastor Dave McConnell sounded very much as good as he does on his sermon podcasts. Some things, thankfully, change less quickly than others. This wonderful little church probably has big change coming when Pastor Dave retires. He has served just over twelve years at Bozeman Methodist. His retirement may loom in the not so distant future. And he will leave really big footsteps. The number of stores open Sunday morning surprised us. The downtown great and large hardware store opens at 9:00 a.m. A half-dozen coffee shops or cafes were open already. We had a nice stroll up Main Street, read the Sunday paper (including the police blotter), and relished in the relaxing Sunday morning with no hurry for anything. 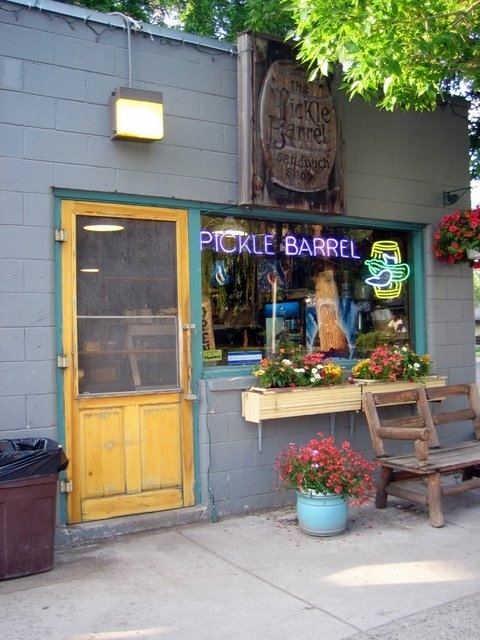 We also took a slow drive by the Pickle Barrel, scene of our numerous caloric crimes two years ago. Tomorrow’s Jim’s birthday, today he was just scoping out the parking situation for a possible probable visit tomorrow after a couple of errands downtown. Things in Bozeman, MT, seem pretty good. We’re happy to be here again and think you would probably enjoy it too. Don’t let the police blotter scare you away. Arriving home after the evening WBCCI program, Julie visited the Airstream’s lavatory. While taking care of necessities, she removed her jewelry and placed them on the cabinet. The jewelry included one of her very nicest, an Italian charm bracelet completely filled with very special charms. When it came time to flush, she incredibly managed to drop the bracelet into the bowl at just the worst moment. Taking a flashlight and kneeling on the trap valve, Julie could see the bracelet directly below the bowl-opening. Thank goodness we had recently dumped. First she tried reaching it with her hand. It could go through, but her arm was not long enough. Then she went through the arsenal of kitchen utensils; spaghetti fork, tongs, etc. None of them worked. Richard suggested she just let it go. But, after her rehearsal of the value of the bracelet, she got his attention and more direct help. Richard’s answer was to fashion a coat hanger into a long hook. On the second try, he managed to snag the bracelet and draw it back up through the flush valve. Just as Julie grabbed the precious bracelet, Richard accidentally loosened his grip on the flashlight. Of course, it didn’t fall outside the bowl. Down it went, before he could get his knee off the valve pedal. The round flashlight rolled away from the “drop zone” below the flush valve. Richard claims he could “see the light,” but lacked any means of hooking the smooth flashlight. On telling about it to the group, we had a lot of fun suggesting ways he might recapture the light. It didn’t help that Richard told Julie that the ingredients in flashlight batteries, when mixed with urine, formed an explosive and could blow up at any moment (it won’t). Murphy’s Law would dictate the light would never exit the tank unless it get sideways in the dump valve. Worse case scenario: it would damage the valve, and should be removed by cutting through the bottom of the Airstream. Most agreed that the first attempt should be to fill the tank with water, dump at the next stop, and hope for the best. Two stops later, Richard reports, it just fell out of the hose. It was the freebie flashlight given to participants in the WBCCI Region 8 rally. Richard did not restore the flashlight for active service, although they considered sending it to me for my birthday. Debbie dropped an earring the other day while standing in front of our vanity mirror. Of course, the lavatory drain was open. And I had only the day before I secured the p-trap nut with “rescue tape” to prevent accidental loosening during travels. The tape cuts easily, the p-trap opened up without incident, and I readily rescued the earring. Not too bad, considering how it could have gone. Some of you might recall our post last year with an accidental waste story, involving a kitchen utensil? Again, good recovery. But when something goes down the drain, our expectations are so low that any sort of recovery at all is better than we might expect. A flashlight lost to recover a cherished charm bracelet is a good deal, so long as the flashlight doesn’t jam the dump valve. Today I realized I have lost my wedding band. We were going to town today to have the ring re-sized, had already checked out the jeweler and were ready to go. Only then, just before heading out the door, did I realize the ring is not on my finger. The ring became uncomfortably tight on my left hand ring finger during the Southwest Caravan in early June. I had stored the ring in my dopp kit until yesterday, when I placed it with a comfortably snug fit on my right hand pinky. 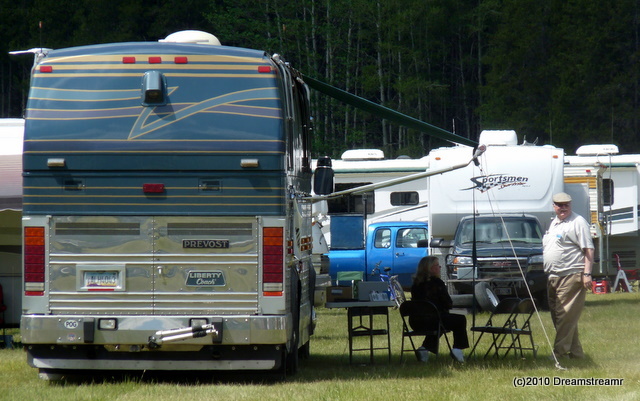 Yesterday late evening, I remember, it was there when we walked a few laps around this campground. Most ironically, I stayed up until just before midnight to finish reading Dan Brown’s thriller, Digital Fortress. The story more or less centers on locating another very important ring and the protagonist’s and hero’s adventures therein. All I can imagine is I lost the ring in a pitched battle sometime after midnight, and I’ll be watching my back. Or, I might check the blackwater holding tank for the ring, in case I dropped it at just the exact wrong moment and didn’t even hear it ‘clink’ on its way down. I should tie a string around the flashlight before looking down there, eh?